(Phys.org) -- University of Maryland Chemistry Professor John Fourkas and his research group have developed new materials and nanofabrication techniques for building miniaturized versions of components needed for medical diagnostics, sensors and other applications. These miniaturized components -- many impossible to make with conventional techniques -- would allow for rapid analysis at lower cost and with small sample volumes. Fourkas and his team have created materials that allow the simultaneous 3D manipulation of microscopic objects using optical tweezers and a unique point-by-point method for lithography (the process of using light in etching silicon or other substrates to create chips and other electronic components). 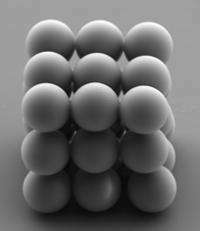 As they report in a research article published in the August issue of Chemical Science, the combination of these techniques allows them to assemble complex 3D structures from multiple microscopic components. This work builds on earlier breakthroughs by Fourkas and his team in the use of visible light for making tiny structures for applications such as optical communications, controlling cell behavior and manufacturing integrated circuits. "These materials have opened the door to a suite of new techniques for micro and nanofabrication," says Fourkas. "For instance, we have been able to perform braiding and weaving with threads that have a diameter that is more than 100 times smaller than that of a human hair." In the paper, Fourkas and his group also showcase 3D structures composed of glass microspheres, a microscopic tetherball pole, and a microscopic needle eye that has been threaded. "One of the exciting aspects of this set of techniques is that it is compatible with a wide range of materials. For instance, we can weave together threads with completely different compositions to create functional microfabrics or build microscopic devices 'brick by brick with building blocks that have different chemical or physical properties." In addition to being enabling technologies for the creation of microscopic analytical and diagnostic devices, Fourkas foresees these techniques being valuable in the study and control of the behavior of individual cells and groups of cells. Simultaneous microscale optical manipulation, fabrication and immobilisation in aqueous media was authored by Farah Dawood, Sijia Qin, Linjie Li, Emily Y. Lin and John T. Fourkas. "... 100 times smaller than that of a human hair." What is a micron? If they can assemble and weave arbitrarily long CNT cables, Space Elevator tech is coming closer every day with this and other similar developments. We should begin to discuss safety concerns and political issues. CNT cables? Not with that precision, not that kind of technology. What they are showing is microtechnology, not nanotechnology.